Convert videos in bulk with THandBrake for Windows | ComTek Computer Services Inc.
You have many options to convert video files to different formats; from one-click options over command line tools to advanced tools that give you full control over every bit of the conversion process. THandBrake is a frontend for the popular HandBrake video transcoder which means that you can use profiles created in the latter. After you have installed THandBrake on your system you are presented with a clean UI. Video files can be dragged and dropped in the interface or loaded using the add button instead. There is also a folder button that you can use to add all supported video files of the folder to the video conversion queue. Each video file is displayed with its name, type and duration by default in the queue with additional information being displayed when you select it. This includes information about audio and subtitle tracks. The program is profile driven. It ships with conversion profiles for mobile devices such as Apple's iPhone or iPad, Android, and select Samsung devices. If the format or device that you want the videos to be converted to is not listed, it is up to you to configure the output parameters manually. You can also do that for profiles by the way, for instance to increase the output quality and save the information to a new profile that you use from that moment on. The program supports the container formats mp4 and mkv, and leaves little to be desired in terms of conversion settings that you can modify. From changing the size of the video over frames per second, audio codec or filters such as deblock or denoise. The preview button that the program offers comes in handy in this case as you can use it to preview your current selection at any time. It takes a moment for the program to convert part of the selected video though and it may take a couple of tries until you are satisfied with the result. Once you are, you should save the configuration as a new profile so that it becomes permanently available in the application. The conversion process itself is simple: select an output directory, click start and watch progress of the conversion on the next screen. You are probably wondering: if you are using HandBrake, why should you use this one instead? The application is easier to use in my opinion. You can batch add video files to it and start the conversion with just a couple of clicks. 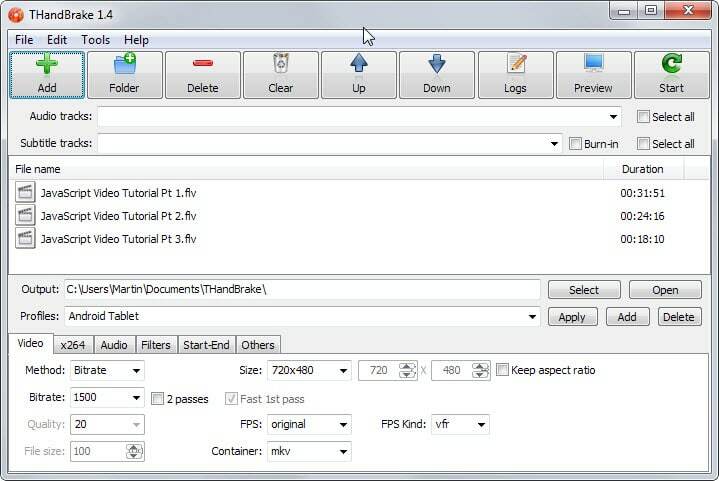 While HandBrake supports queues as well, it is not as easy to set up. THandBrake is an easy to use program that offers solid conversion options. The main issue that some users may have in regards to it is that it does not support many output formats. While mp4 should be fine in most cases some may require support for other formats which the application does not offer.